The OABA was just a dream to a small group of showmen in 1964. Today it is a reality to thousands of members. The story has almost reached legendary proportions. A dozen showmen, meeting in John Vivona’s suite at the Sherman House in Chicago, put down $100 each to pledge their support for a novel concept ….a trade association working on behalf of the carnival industry. Today, those showmen who attended that historic meeting are referred to as the “founding fathers.” Many recall that their industry colleagues said it couldn’t be done. In an industry known for its keen competition, the naysayers asserted, you’ll never get showmen to agree on anything, let alone cooperate for the benefit of the whole. They have been proven wrong. For over 45 years the Outdoor Amusement Business Association has been helping to keep the show on the road. Problems affecting the industry were surfacing in Philadelphia and John Vivona (Amusements of America) placed a call to make a luncheon date with E. James Strates (James E. Strates Shows). They discussed the concept of forming a trade association to deal with some of the problems which were larger than those normally dealt with by one carnival company. Strates agreed to contact a list of interested showmen and the Vivonas contacted others. That November in Chicago, during the showmen’s convention, the group met in the Vivona suite and organizational efforts began in earnest. The need wasn’t just to act against union organization attempts. Problems such as federal minimum wage and hour laws and interstate commerce regulations also threatened the industry. There was a pressing need from the industry to reach with a united front. OABA records show the original contributors to have been Blue Grass Shows, Century 21 Shows, William T. Collins Shows, Deggeller Amusements, Johnny’s United Shows, World of Pleasure Shows, Thomas Carnival, James E. Strates Shows, Royal American Shows, Olson Shows, Amusements of America, and Luehrs’ Ideal Rides. The loan was repaid in 1968. The next step was Tampa, Florida, and the annual carnival industry get-together at the old Tampa Terrace Hotel. It was there, in February 1965, that the OABA was officially organized and founded. John Portemont, of All American Shows, remembered that C.C. Groscurth named the organization. Groscurth, then owner of the Blue Grass Shows, “got up in the meeting and suggested we call it the Outdoor Amusement Business Association and we decided on that name,” said Portemont. Showmen’s associations from around the country contributed funds. Officers and a Board of Directors were elected: W.G Wade, the OABA’s first President; Robert A. Reid, First Vice President and Secretary; William T. Collins, Second Vice President; John Vivona, Third Vice President, and John G. Reid, Treasurer. The directors that first year were Al Kunz, Rod Link, John Portemont, C.C. Groscurth, Charles Edens, Irvin Deggeller, Bernard Thomas, Hub Luehrs, Albert Steele Jr. and Hal Eifort. From the beginning, Hub Luehrs, Luehrs’ Ideal Rides, lobbied for an ethics code, ride safety, safety training programs and guidelines for carnival games. “The original $1,200 the founding fathers invested in 1964 was money well spent,” said Luehrs. With the memory of the high cost of lobbying still fresh in everyone’s minds, the organization set out on a fundraising crusade. The hope was to establish a fund in addition to annual dues, which would be used to finance lobbying and legislative costs. The result was the OABA Assessment program, which was established in 1967. More than two million dollars have been contributed to this fund over the years to fund legislation favorable to our industry. From the pioneers at the beginning to today, it is the membership that is the backbone of our organization. 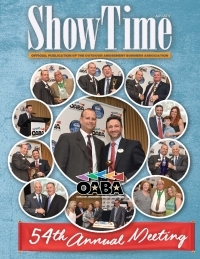 For more than 45 years the OABA has provided thousands of members with excellent membership services in such areas as safety, public relations, its monthly “ShowTime” magazine, the official annual publication, “The Midway Marquee” and nationwide membership discounts. Its dedicated officers, Board of Directors and Trustees, along with our hard-working staff, have made a commitment to serve this great trade association in their free time and at their own expense.